(List price: $48.00) Will begin shipping in mid-October. This book is only available through the publisher. The hardcover is published in a limited edition of 250 copies and will ship at the end of October. and the New York City Book Award for Fiction. ELIZABETH ADAMS is a writer, publisher, graphic designer and artist. She is the author of Going to Heaven (2006), a biography of Bishop Gene Robinson and history of the religious/political debate over homosexuality, and has written a blog, The Cassandra Pages, for the past 11 years. HOYT ALVERSON, Professor of Anthropology, emeritus, taught at Dartmouth College from 1968 to 2011, and has been actively involved throughout his life in social causes such as civil rights, anti-war efforts, and the anti-apartheid struggle in South Africa. STEVE TOZER, an educator for the past 40 years, is Professor in Educational Policy Studies at the University of Illinois at Chicago and Director of the UIC Center for Education Leadership, and the editor of several textbooks on educational theory. Photographer Jonathan Sa’adah gives an unglossy but deeply human view of the period from 1968 to 1975 in richly detailed, observant images that have poignant resonance with the present. Capturing the tipping point when television was just beginning to establish its advertising and journalistic muscle, and corporate power was starting to erode centuries of rural, local identity, the photographs show economic and social dislocation, student and faculty opposition to the Vietnam War, and idealistic young people going back to the land. They delineate a fractured society, in which a threatened younger generation challenged a political elite who were already placing the footings for endless war. The book's ninety-one sepia photographs are arranged in three sections: "The Roads," "The War," and "The Garden." It includes an introduction by Teju Cole, essays by Elizabeth Adams, Hoyt Alverson, and Steven Tozer, and a preface by the photographer. Special pre-order pricing thru Oct 31 only, on all versions -- a particularly memorable gift for those who lived through the 1960s, and for their children. "It is a book of a time in a country's life, but also one that obliterates the distance between the present and the charged past. The photographs are the work of a master, one who somehow aligned his heart with his head, and aligned both of those with his soul." 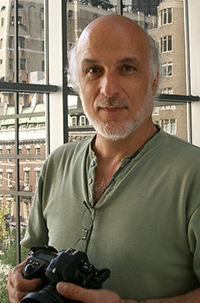 JONATHAN SA'ADAH was born in 1950, two years after his family immigrated to the United States, landing in the small uphill Vermont community of Woodstock. By the age of 16 he had learned the overall outline, if not the mastery, of what it meant to be a photographer. He studied art history and photography at Dartmouth College (1968-1972), and at MIT with Minor White. After completing his formal education he worked as a photographer, selling prints to collections and individuals. He received a Reynolds Fellowship in 1975 which he spent in Paris working with film director Joseph Losey. On returning to the United States, he began receiving larger professional assignments, and in 1981 founded a communications firm in Vermont with his wife, a graphic designer. The couple moved to Montreal in 2005. 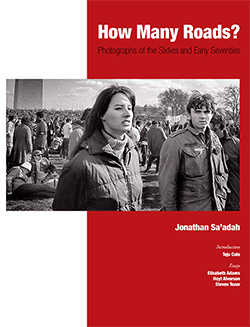 Jonathan Sa'adah’s main interests as a photographer have been portraiture, street photography, and pictures of social change. The photographs in this book are early examples, where the film was illuminated by the experiences and conditions of the time. jump out at us and suggest there is still time and opportunity." You Have Seen Their Faces. They have stayed with me for more than six decades. I hope Sa'adah's How Many Roads? will have the same impact on young people today."